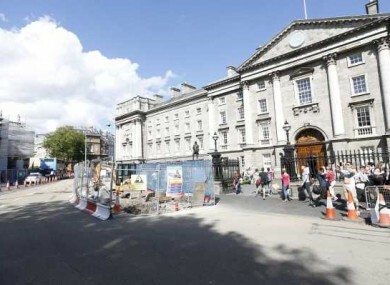 BONES WERE DISCOVERED by Luas cross-city construction workers outside Trinity College’s front gate this lunchtime. Director of Communications for Luas Cross City, Grainne Mackin, told TheJournal.ie that workers have “uncovered what we believe to be historic remains”. She added that the remains may be medieval. Upon first visual inspection they appear to be human remains but a sensitive excavation will be carried out. It could be done by tomorrow or Friday. Luas works will continue outside of the cordoned area where the bones were unearthed. The authorities have been alerted about the discovery including the National History Museum and the Department of Arts, Heritage and the Gaeltacht. Email “'Human remains' found during Luas works outside Trinity this afternoon ”. Feedback on “'Human remains' found during Luas works outside Trinity this afternoon ”.